Domestic cat not a beast. Screenshot annotated by PoC. Please God spare me this nonsense. Get some glasses please, and acquire some common sense. I must be taking it too seriously because the whole story is a joke. A means to entertain some people for a while. The Mail pays for videos. Becky Abrey filmed this cat in a field near to where she lives and sold it to the Daily Mail online for what? About a £1000 perhaps at a guess. This is a black moggie domestic cat in a field. Period. No more discussions please. Becky saw the ‘beast’! in a car park by Praa Sands’ beach in Cornwall, UK. Big deal. I’m scared. Or bored. 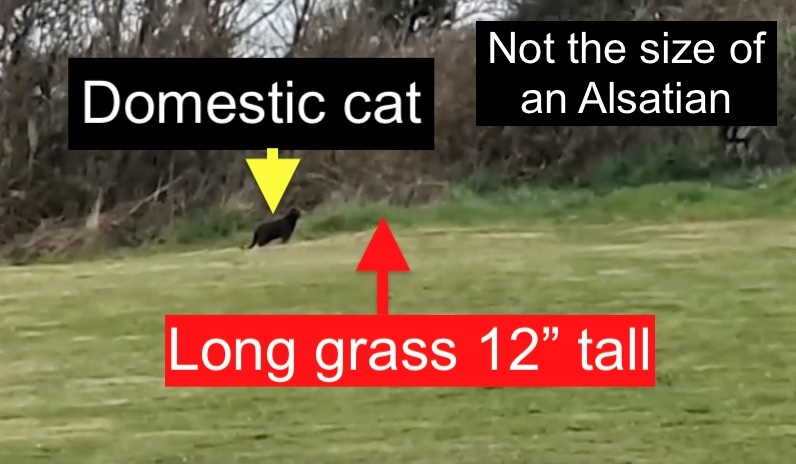 I am sure that people are having a joke because even a person with the most imaginative minds couldn’t mistake the cat in the video with anything other than a black domestic cat enjoying some outdoor fun time. This is not a black panther on the prowl. You can scale the cat from the length of the long grass and hedge beyond. It is absurd to think of anything other than a domestic cat. The Mail reported describes the cat as the size of an Alsatian dog. There have been paw prints 5″ across so we are told. But the print has not been identified as belonging to a ‘big cat’. It is crazy to do this. And there have been mysterious big cat sightings in early April in Cornwall. A dog was attacked but…it’s all BS to be brutally honest. ‘I didn’t want to get too close and zoomed in and out so you can get some perspective. It was at least Alsatian sized or bigger. She added: ‘It’s crazy. I still can’t quite believe it. Honestly, it was huge, far bigger than any domestic cat. Sorry Becky you are having a laugh and good for you. It is nice to have a bit of fun but beware of the potential negative consequences. This entry was posted in big cat sighting and tagged big cat sighting, big cat sightings, cat video by Michael Broad. Bookmark the permalink. Yeah, if she’s joking or pulling one over on whoever buys it, she’s a fraud. If she’s serious, she’s delusional or just mistaken. By saying she tried to gain visual perspective makes me think she believed it, or she’s a very good liar.